Toy box delivered to the customer. 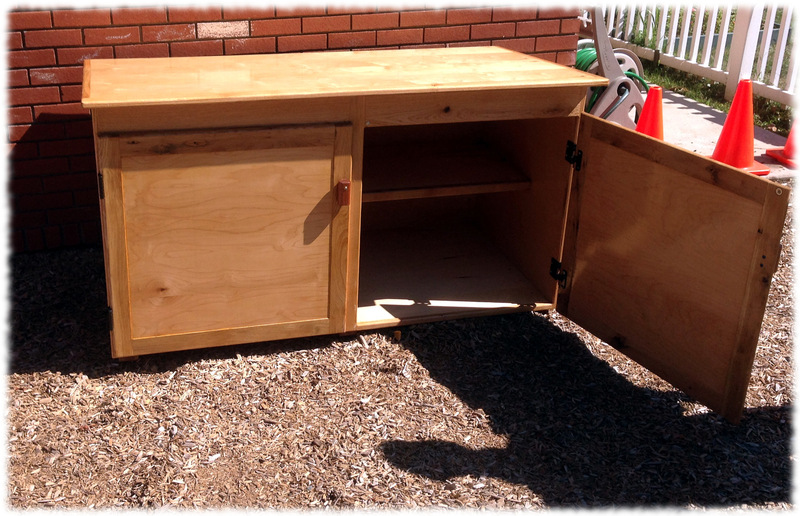 At the beginning of the summer, Susanna asked me to make three outdoor toy boxes for the her preschool (her classroom shares the three playgrounds). The school paid for 9-sheets of plywood and some wood varnish. 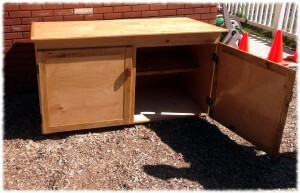 I donated my time, some additional lumber, hinges, and screws as needed to finish the project. This is my first commission project – even though I’m not getting paid, there is a customer involved. The plan was to finish all three and deliver them at one time. However, the summer was busy, and I don’t have that much space in the workshop, so I am working on one at a time. I finished the first one last week and delivered it today. Next time make sure to bring some tools to tighten up any fasteners that loosen up on the drive. I should have removed the doors for the drive, the doors are heavy and it is a pretty bouncy drive down to New London. The magnets are too weak. I’ve ordered new magnets to hold the door shut. I should bring some equipment (rakes, etc.) to level the area where the boxes are to be placed. I’ll have to head back next week and tighten fasteners and change out the magnet holding the door shut with a stronger magnet. Despite all that, it feels good to get a project out the door. The boxes are 5-feet wide, 3-feet deep and almost 3-feet tall and are constructed from hardwood plywood (from the box store) with a mix of red and white oak for edging. The hinges allow the doors to swing all the way open and are held open by magnets on the sides of the boxes – hopefully having the doors out-of-the-way will keep the kids from hanging on them. I think these boxes would hold up longer if they were constructed from MDO – but the materials could cost twice as much, and I think I would have to paint the MDO. Now onto the next box. Maybe I’ll change it up a bit and use maple for the edging. Or sapele. No wait that I’m saving that for the boat. I’ll be pretty tired of building boxes when I’m finished… but heck, Susanna wants one for up on the patio. Anyone else interested in outdoor boxes? Considering a sheet of good (i.e. non-box store) plywood costs over $100, it would certainly be much cheaper to get plastic boxes from the box store, but the wood boxes look much nicer. ← Yet another sailing post!